AND CLUBS SUFFER - "VENDORS"
Entries are declining in both AKC and CFA shows. We as vendors (in case you haven't noticed) are not participating at the smaller dog shows or one-day cat shows. Why? You drive all night, you set up early, you tear down and drive back late. So why is this a problem? We can’t afford it! At one day cat shows, there’s little or no gate, i.e. spectators and the same with small, un-promoted dogs shows. Exhibitors are busy showing their dogs/cats and do not have time to shop the vendors. Most professional dog handlers don't buy from the vendors, they carry their supplies with them. But if you’ve lost your brush or coat dressing, you are desperate for a vendor! Spectators, if they show up, like to shop too. So it’s simple; if the vendors don't cover their expenses, next show venue they don't vend. There is one thing AKC dog shows and CFA cat shows had better 'get'. No vendors, no gate, no show, finished. Dog and Cat Shows are a spectator sport, it isn’t all about comparing breeding stock. In addition to entries, it is the spectator gate that all clubs count on. This is free money for the clubs. There is no expense related to the gate. Spectators are extra income for clubs to offset show expenses. And most dog shows charge handsomely for vendor space, which is also extra income. But for Vendors, the gate isn’t “extra” income, they count on spectators! That is where most of our sales come from. Instead of solving the problems (I will cover the second in part two) some clubs are not even putting on shows anymore. The first solution is advertise the show! If they don’t know about a dog or cat show event, local spectators (gate) will not come. Exhibitors also need gate to show off and sell puppies/cats to people interested enough to attend a show. Many people won't buy what they cannot see. PETA and HSUS are doing their best to defeat us, including trying to sabotage dog and cat shows and making breeders fearful of local advertising. But clubs can advertise the show, thus affording vendors, exhibitors, and spectators the opportunity to connect. For certain we are all facing difficult times in lieu of the ARist agenda and now the economy but you won't have a show if you do not get priorities straight. Advertising the show is a priority! Spectators come to see particular breeds but with most of AKC dog shows, you show your dog, you take your points and go home or onto another show the following week-end. Since there are just a few bench shows left, potential puppy buyers come to a show to see a particular breed but by the time they get there, that breed is judged and the exhibitors are gone except the BOB winner tucked away somewhere in the midst of the grooming area. There is nobody to talk to, ask questions of and learn about that particular breed. Spectators rarely stick around until Group judging because they don't want to see just one dog of each breed, they want to see several. Did I mention also that a lot of exhibitors are just plain 'rude' and too 'obnoxious' to take the time to talk to spectators? At least with the way cat shows are structured, you are there until the very end, as you never know if your cat will be called for a final. There is plenty of time to chat with the 'gate' and brag about your breed. 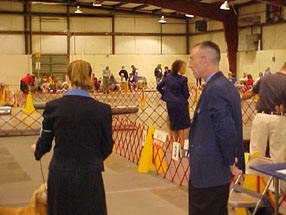 AKC could change the way dog shows are run and educating the public should be a major concern of the show giving clubs. Putting out pamphlets is okay but first you have to get the spectators there! Then you have to give them what they came for – hands on time with dogs and dog breeders. Whether the clubs make it mandatory that dog show exhibitors are not allowed to leave until after a specific time and both AKC and CFA makes show approval dependant on local newspaper ads, perhaps even the times a breed is to be judged. Spectator gate and one-on-one educational opportunities are priorities and clubs should not be allowed to hold a show the following year unless they provide what spectators and vendors come for. And speaking of what spectators come for, I have noticed that at the really big shows like the Houston shows, you cannot get near the show ring to ask a question or get a card from anyone coming out of the ring. What a joke that is. A person pays to go to a dog show to decide about a particular breed they would like to inquire about and they are practically BANISHED! They can only watch the dogs “show off” in the ring and then the handler rushes off to the private grooming section or to another ring just when the spectator thought they might get a 'hands on' experience and talk to the exhibitor… well, guess what happens? Next year when the show comes around, they won't even go. After all they can order their shampoos and toys on line or go to the big box stores. They may have decided to order their puppy or kitten online, at least they got to talk to someone who is happy to answer questions. Back to no gate, no vendors = no show clubs. I recently took issue about this with the cat fancy. Although the cats and their breeders are much more accessible to the public, cat show entries are also down and I suggested changes be made there too. I bluntly pointed out that it was unfair to cat show vendors to have people price shop on line and then comparison shop cat show vendors, and then go to a dog show to buy stuff because it was cheaper! 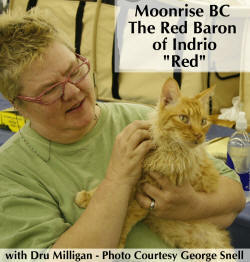 I found that absolutely appalling as it is the cat show vendors, like the dog show vendors, who support the sport. I do not see dog show vendors recommending to feed a cheap dog food in order to help cover expenses for the next show as was suggested by the one of the cat fancy powers to be. She even went so far as to suggest buying Wal-Mart litter to cut expenses. The problem with this is that two major corporate sponsors for cat shows are Royal Canin pet foods and Dr. Elsey for litter. The corporate sponsors for AKC dog shows pay a huge amount of money to the clubs. Many clubs count on that corporate income offset the show expenses and the dog food companies bring in tons of dog food, set up a booth and people buy like crazy. Even some show people wait to stock up on food at the shows but some dog food sponsors no longer support dog shows. Why? Because the clubs don’t advertise enough and cater to spectators like they used to. They got too big on the income from corporate “vendor” space and forgot why they held dog shows. So the gate dropped off, corporate support went away, and, well you see what happens. Even if you don't buy their dog food (we do not use the main sponsored cat food), please stop by the vendor’s booth and let them know you appreciate them being there and supporting the club.